I am old enough to remember banked track roller derby of the 70s. I always thought those women were really strong, and they were bad*ss on skates. I've always loved roller skating, specifically quad skates. A friend had mentioned something about roller derby 10 years ago and I think that had stuck in my subconscious. Then, one fateful weekend in 2013, I started to roller skate again with these all terrain skates at a local roller rink. I told my friend I was with that I really need to get a pair of quad skates again and, oh, I dunno.. maybe join roller derby. I was actually joking at the time. This was a Friday night. Saturday morning while I waited for a skate shop to open I decided to look for local roller derby. Dallas Derby Devils was actually having tryouts that Sunday. As soon as the store opened, I got a pair of R3s, went to the rink that Saturday afternoon to skate a bit, then showed up bright and early Sunday morning ready to tryout for DDD. I failed and didn't make the league. But that didn't stop me from learning and 9 months later I tried out again and made the league, very much to my surprise. I am a software developer. My name is a play on the word "hexadecimal," a base 16 number system. My jersey number is 16. Some of the nicest, most generous with their time women I have met has been in roller derby. Realizing that I can be friends with women doesn't mean it has to be a competition - and ironically enough, I am in competition with these women on the track. But off the track it's not like that at all. Yes - but not seriously, like broken bones or anything. I have a permanent indent on my left thigh from having fallen on skate wheels twice in one week that resulted in a hematoma that lasted for quite some time. I've also had two fingers run over twice. That was a rough week. When I am able to hold a jammer - even if it's just enough so that my jammer gets out and gets lead. Doing a 180 jump on one foot. I am a very good seamstress and can do embroidery fairly well. I've also been picking up shotgun sports lately. For me, right now, it's 3 things: my beau and our dog, work, and roller derby. 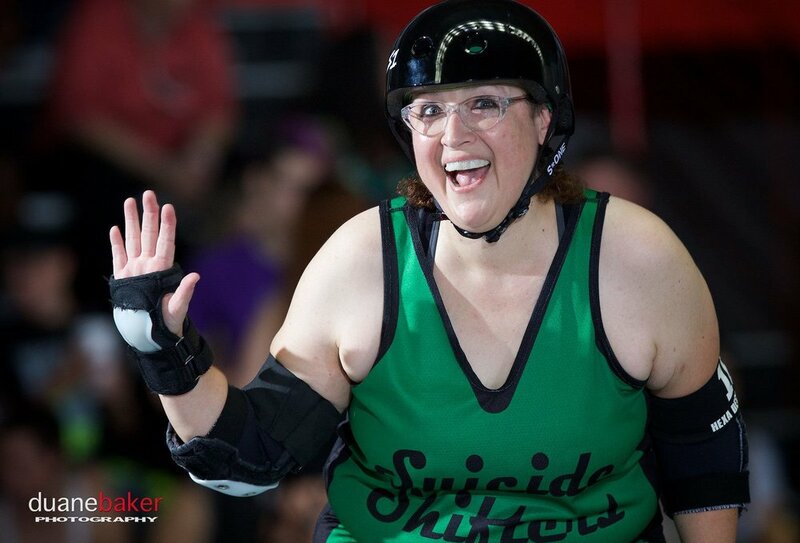 When I first joined roller derby, everything got squeezed - 20% my life, 80% roller derby. I was just so excited about it. Over time I've learned to manage that time out fairly equally, especially at the request of the beau. Hockey stops. They're scary but they're amazing stops. The day of the game I have to do a craft of some sort. Either embroidery or paper crafting. Since I have a job that, while creative to be sure, is quite cerebral and keeps me in my head 40+ hours a week. I need a creative activity that is outside of myself so I do some sort of crafting project. People aren't lying when they tell you to cross train. Also, get your breathing checked.